It’s fun to have friends and family round for sociable meals but sometimes we’re just too busy or exhausted to prepare and provide for guests, especially a large group. Our ideas for lazy entertaining should ensure minimal effort and organisation, and your guests will be having far too much fun to notice. A winter meal, perhaps a bonfire or Christmas party, could easily take hours to prepare, so why not go informal and cook up a chilli or a couple of different curries? Once cooked, they’ll stay warm for a while and will go nicely with easy baked potatoes and nachos with a little salad on the side. You could also extend your party into the garden and light up the barbeque. A few fairy lights or lanterns will transform your garden into a winter wonderland while the barbeque provides comfort food and warmth. A meal where everyone gets involved is great fun and guarantees minimum effort from the hostess. Knock up an easy fondue recipe and simply supply your guests with food to dip, from vegetables to bread or cooked meat. 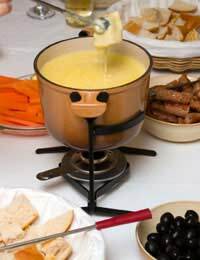 Though potentially messy, a fondue night is a sociable and entertaining way to spend a few hours with loved ones. For something a little different, try raclette. Using individual mini grill pans, guests pick and cook their own ingredients, including meat, fish and vegetables. You’ll need a special raclette grill for this one, but it’s a meal everyone will enjoy. For the really lazy, supermarket entertaining ranges might be the answer. Things have moved on a bit since sausage rolls and mini pizzas – these days many supermarkets provide freshly made recipes to order, and cover every occasion, from party food to formal dining. If you order online you can pick and choose from vegetarian, diabetic and even coeliac-friendly dishes, all delicious and very low maintenance. Summertime brings barbeque weather and you can go a long way to beat a good barbie. Invite your guests to bring their own food to cook and you’ll be able to get away with providing easy salad and nibbles. We all enjoy mucking in at a barbeque and most people wouldn’t dream of turning up empty handed, whether or not you ask them to bring their own food. Open some wine, perhaps make up a jug of Pimms and you’ve got the makings of a fabulous summer evening. Desserts are easy, too – barbequed marshmallows are great for kids, while fruit baked in foil on the dying embers makes a delicious and easy end to a meal. With ideas like these your lazy entertaining doesn’t have to give the game away. Your guests will be having too much fun to notice both your clean kitchen and your suspiciously calm demeanour. We all live such busy lives these days that entertaining friends and family shouldn’t be another thing to worry about. It’s perfectly possible to provide fantastic food and a great atmosphere without running yourself ragged.